Give Me My Remote > Reality TV > Reunited: Real World – A Social Experiment? Reunited: Real World – A Social Experiment? Remember when The Real World first premiered and it was akin to a social experiment? Put seven strangers from various social, economic and geographic background and see what happens when they stop being polite, and well, you know the rest. Back in the day Julie, Eric, Heather B and the others housemates lived their lives in relative obscurity. No one knew who they were, or why cameras were following them. Remember, The Real World was essentially the first reality show. Being a reality TV star just didn’t exist. But after the first season aired looking in on the lives of seven strangers seemed a bit less authentic when they knew we were watching them. The Real World slowly turned into a platform for self promotion, and being famous for doing nothing became a part of our culture. I’m not sure when Bunim and Murray, the producers behind the show, just gave up on trying to create something organic, but they most certainly did. The Real World soon became a freak show where the only qualifications seemed to be a nice body, a tendency for promiscuity, and a love of hot tubs. If you were pretty and had Daddy issues you were an ideal housemate. Of course the producers sought out those with emotional issues as a way to create drama in the house and disguise it as a lesson akin to an after school special. Each season you could count on at least one gay character, someone that had race relation issues, and of course the housemate one the verge of entering AA. Each season of The Real World became more outrageous than the one before. The characters a little larger than life, and the drama a little more…well, dramatic. But all best were off when the producers moved The Real World to Las Vegas. It’s as if they were praying that the City of Sin would live up to its name. And oh how it did. From the minute we met Trishelle, Steve, Alton, Irulan, Brynn, Frank and Arissa moved into the penthouse suite at the Las Vegas Palms Resort and Casino you knew things were going to be just a little more intense. I mean they were living in a casino!! Gone were the days of the housemates innocently flirting with each other – now they were just sleeping with each other (or at least trying to) every night. The liquor poured freely and the partying was 24/7…as was the drama. 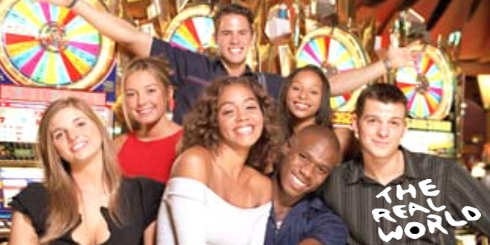 Well, it’s been five years and The Real World is reuniting the cast of The Real World: Las Vegas to see what life is like when the seven former cast members return to their home of five years ago. Reunited: The Real World will air this spring on MTV. Have the housemates matured over the years? The producers are surely hoping they haven’t. Most of the cast are living off their reality TV fame, making their living by doing other MTV reality shows (Real World/Road Rules Challenge) so it’s not as if they truly experience what it means to actually live in the real world. It will be another kind of social experiment all together to see if these adults have learned anything from their past mistakes. And yeah, I’ll probably be watching. Real World: Las Vegas was the season that turned me off of the show altogether. It was so trashy and mindless, but not in a good way — in a “I need to bleach my brain and read some fine literature to regain brain cells” sort of way. Of course, I think it was the show’s best rated season. Heh. psst! Kath! your headline is mis-spelled! exactly. Las Vegas was the beginning of the end. Las Vegas was the last season I watched. I realzed that I was no longer in the MTV demographic. And I really haven’t watched anything (except Punk’d and a few MTV Cribs) since. Until last night. I tuned into the new RW/RR Challenge. I barely recognized any of the ‘kids’. Timmy, really? Isn’t he like 40 now? All the blonde girls look alike. There was a time back in the day when RW and RR were actually good. Like when the RW kids had to have a job and the RR kids had to actually give up with money and live in an RV for a few months. As for the LV reunion, don’t these people still see each other? I would say the only ones who might actually have a life other than tv realated are Brynn and Frank (and I am kind of sad I know that). If I catch it, I catch it. If not, I won’t be sad I missed it. I totally agree with the other comments. While I watched the Las Vegas season, it was the beginning of the end. I haven’t followed a season closely since then. For me, New Orleans was the last great cycle. Those kids had fun that was tied to alcohol and flirting yes, but not the drunken slutty hookup-debauchery that has become the Real World of late. not true about frank or brynn. brynn got knocked up but still does bar tours. and frank is jobless and goes to college bars in la. sad because he had potential. The next time I learn a weblog, I hope that it doesnt disappoint me as much as this one. I mean, I do know it was my choice to read, however I really thought youd have something attention-grabbing to say. All I hear is actually a bunch of whining about something that you could fix for people who werent too busy in search of attention. I am curious to find out what weblog system you come about to become utilizing? I’m experiencing some minor security problems with my latest web site and I’d prefer to discover something additional safe. Do you might have any recommendations? You want to join in a contest very first with the finest blogs on the internet. I most certainly will suggest this web site! I went more than this web site and I feel you might have a lot of exceptional info, saved to fav (:.